Pinkard Construction recently delivered Sienna Sloans Lake, which was designed by Van Meter Williams Pollack. Koelbel and Co. and Trailbreak Partners developed the 49-unit affordable apartment project on the old St. Anthony Hospital campus. 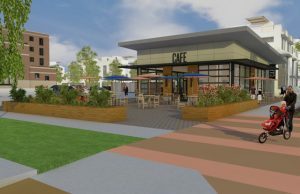 “Sienna Sloans Lake thoughtfully transforms a hole in the fabric of the city into an area of vibrancy and inclusiveness that the community can be proud of,” said Trailbreak Partners’ Doug Elenowitz. “This project was enormously complex, and not for the faint of heart. I can honestly say that without (this team’s) vision and commitment and perseverance, it wouldn’t have been completed.” VMWP was responsible for the full-block master plan and the specific architecture of the adaptive reuse of the Kuhlman Building, and the new retail building with the plaza, according to Tim Van Meter, partner, Van Meter Williams Pollack LLP. As construction manager/ general contractor, Pinkard Construction conducted a complete gut and complex renovation of the 78-year-old Kuhlman Building, a former nunnery and nurses’ residence. “This was a heart, lung and liver transplant,” concurred Van Meter. The design team had to bring all new building systems to an environmentally challenged structure: Each new dwelling unit is unique due to existing window locations and changing existing structural conditions. Each floor level was also different. “Transforming old buildings into new uses is harder than new construction,” Van Meter continued. The newly completed development contains units ranging from studios to two bedrooms. All units are exclusively for households earning up to 60 percent of the area median income (up to $37,800 for a single-person household, or up to $48,600 for a family of three). As for challenges involved in affordable housing design versus market-rate, it comes down to the scrutiny, according to Van Meter. Sienna Sloans Lake also features 5,000 square feet of retail and is located close to public transit.